Welcome to the youth ministry here at The Church of Columbus. It doesn’t matter who you are, or where you have been, or what you have done, you’ll find a home with us. Unconditional love and acceptance is the example Christ gave to us, and since being like Jesus is our ultimate goal as Christians, we work hard to live it out in our ministry.
" 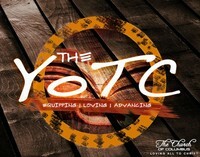 The YoTC" stands for The Youth of the Church and we understand that young people are the future of the church. The YoTC meetings on Wednesday Nights are an opportunity for young people to gather to learn how to live for Christ in a fallen world. Youth share with other youth the challenges they face and encourage one another as brothers and sisters in Christ. Your child will never forget the speical bonds they make in The YoTC!